Observed on the rim of the Elgeyo Escarpment near Iten, Kenya. January 2012. FLOWERS: White to cream flowers small and arrayed in elongate spikate heads. SHRUB or TREE: Medium to large flat-topped tree. 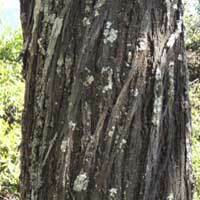 The bark is dark brown to gray appearing fibrous. LEAVES: Leaves are twice compound with the ultimate segments quite small and numbering up to 28 pairs. The leaves appear feathery. 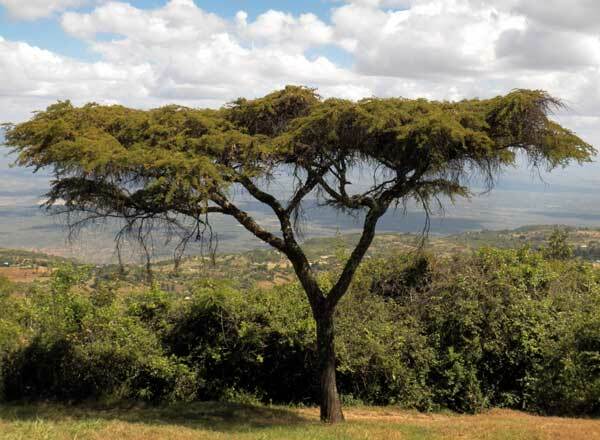 RANGE: This tree is found at higher elevations up to 2500m. FRUIT: The brown bean pods are straight or slightly curved about 6 cm long. ARMED. The paired spines are straight and several cm long.